Motoracing at Silverstone on Good Friday started off with the European Le Mans Series laying the first rubber on track. The 35-car strong field took to the track to complete the second practice session of their weekend. Ben Hanley took full honours in the LMP2 field by setting the fastest lap of the session for DRAGONSPEED. United Autosports lead the way in LMP3 with the #2 for the majority of the session but in the closing minutes the sister car of the #3 with Wayne Boyd stealing the top spot. Aston Martin was quickest again in LM GTE, with the #99 Beechdean AMR car taking the fastest lap of the class. Track limits were the talk of the session as multiple cars were being reminded to not abuse them. The key corners that were culprits to running wide were Luffield (Turn 7), Copse (Turn 9), and Club corner (Turn 18). AT Racing were handed a warning for track limits abuse as their drivers were pushing the limits too much throughout the 90-minute session. The session began with what appeared to be a test for the Full Course Yellow system. After a ten minute period at reduced speed the track went green and allowed full speed testing to begin. It was initially the #40 Graff ORECA 07/Gibson that lead the field, but as the track evolved so did the lap times. It was with about half an hour of the session left that Hanley went quickest with a 1:44.647. Richard Bradley was not deterred in the #40 Graff entrant and chased down his fellow Brit for the fastest time. Bradley couldn’t beat the lap time of the #21 DRAGONSPEED challenger but got to 0.209 seconds off the pace. The #32 United Autosports took the third fastest LMP2 time with the #39 Graff and the #25 Algarve Pro Racing rounding off the top five. The #29 Racing Team Nederland car got in a spot of trouble in the closing stages of the session. With about fifteen seconds on the clock, Frits Van Eerd found the Dallara P217/Gibson stopped at Aintree Corner. Whatever the issue was, Eerd appeared to clear it fairly quickly as after a short spell of yellow flags the car was back running. It finished 9th in the LMP2 class, 4.086 seconds off the pace of the #21 DRAGONSPEED. United Autosports dominated the LMP3 field. Until the closing moments, it was the #2 that held the fastest lap on the board. The time that was set at the beginning of the session was over a second faster than the time set by second place in class. As the track rubbered in, drivers started to challenge the phenomenal lap time of the #2 United Autosports Ligier JS P3/Nissan. John Falb ended up finishing in the car in third place, behind the sister car #3, with Boyd on board, and #16 Pain Barthez Competition in second. Boyd put in a fastest lap of 1:55.101 at the end of the session, just over three-tenths faster than Simon Gachet in second. However, as soon as the chequered flag had dropped, the #3 and the team were called to report directly to the stewards. It is unknown why. Most of the drama from the session was caused in the LMP3 class. About half an hour into the session, the #19 M.RACING – YMR Norma M 30/Nissan had a very near miss with the #15 RLR MSPORT. Coming out of Club Corner, the #19 lost the rear and spun around, nearly collecting the #15 as it rolled back across the racing line. Luckily neither car made contact and the pair continued their session. The #12 Eurointernational Ligier JS P3/Nissan pulled out the final yellow flags of the session when the car stopped at Luffields. The car returned straight back to the pits when it got moving again and did not go back out on track before the chequered flag fell. Aston Martin was the team to beat again in LM GTE. The #90 TF Sport car initially held the pace, followed closely by the #99 Beechdean AMR entrant. However, the TF Sport car spent a lot of the session in the garage. This meant when the track started to get quicker, it was left behind when the lap times began to fall. #99 Beechdean took a fastest lap of 2:00.547 whilst the other Aston Martin V8 Vantage running team finished at the back of the LM GTE field, 1.050 seconds off the pace of the sister car. Ferrari and Porsche rounded off the top three, with #55 Spirit of Race second place, only three-hundredths of a second off the fastest lap of the Beechdean Aston Martin. #77 Proton Competition Porsche made it three different manufacturers in the top three, a couple of tenths off the front-running pace. The only car to not set a competitive lap time was the #4 Cool Racing by GPC LMP3 car. It completed 18 laps on track with a fastest time of 2:02.003, around half a second off the slowest LM GTE time. It is unknown why the car was so off the pace of the other LMP3 cars. In comparison, the #4 was 3.295 seconds off the pace of the slowest LMP3 car. Hopefully, whatever issues it had will be sorted for qualifying later on today. The Checkered Flag’s correspondent for the FIA World Endurance Championship. 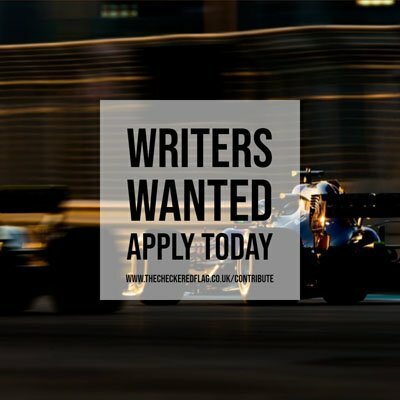 Working in motorsport as a hobby and as a professional: a Digital Account Manager at Patterrn offering Social Media and Digital Marketing for Brands, Teams and Drivers in all disciplines of motor racing.